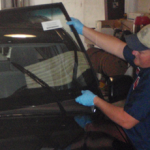 Knowing the proper care regimen to follow after your Houston windshield replacement can ensure the greatest longevity and stability for your new installation. Giving your vehicle a little tender loving care can be a good first step toward protecting your windshield after this major repair. Here are some key tips for reducing stress on your Houston auto glass after a full windshield replacement. Most Houston auto glass sealing materials require 30 minutes to an hour to set. Trying to rush this process can result in a less secure seal for your windshield and could reduce its useful life. By taking a little extra time before taking your vehicle out for a spin, you can ensure the best seal and the greatest durability for your windshield replacement in Houston. Allowing hot air to escape through an open window can prevent pressure from building up inside your parked car. This can prevent your windshield from becoming unseated from its sealing materials during the curing process. If possible, parking in the shade or inside can be an effective alternative measure and carefully close your car doors at all times, no slamming until the sealing materials have cured. While normal rainwater is unlikely to cause serious damage to your windshield, avoid hot-temperature or high-pressure car washes for at least three days after your windshield is installed. Exposure to extremely high temperatures or high pressure can cause damage or warping of the seals that hold your windshield in place. If your auto glass technician left tape around the perimeter of your windshield, you should leave it in place for at least 24 hours before removing it. This tape is often necessary to assist in the curing and sealing process. 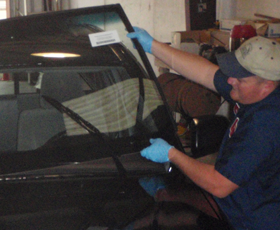 Removing it too early could result in a weakened seal and reduced longevity for your Houston auto glass. Avoiding bumps and impacts during the first week after your windshield installation can prevent it from becoming unseated and unsealed. Avoiding off-road expeditions and driving carefully can be a solid step toward extending the life of your new windshield and ensuring the safest operation for your vehicle during this period of time. The Houston auto glass experts at Apple Glass can provide you with the most comprehensive repair and replacement services for your vehicle. We also offer residential and commercial glass services to ensure that your home or business stays comfortable and secure. If you need mobile replacement services or a free quote for your repair or replacement, call Apple Glass today at 713-680-1400 in Houston or at 281-296-0600 in The Woodlands. Our expert glass technicians are ready to serve you. This entry was posted in Windshield Replacement And Repair and tagged Houston Auto Glass, Houston Windshield Replacement, Windshield Replacement in Houston. Bookmark the permalink.